2月1日の ROCK OR DIE Monthly #32 は、リスナーに CD プレゼントあり! 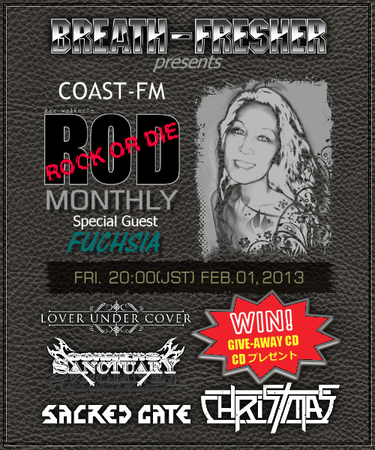 ROCK OR DIE Monthly #32 is aired at 8 pm (GMT+9) on Friday, February 1st 2013. Following 4 bands are featured and announcement for "Special CD give-away" comes up on the show. After it was aired in Japan, we will upload it on a podcast you can hear. CHRISTMAS - EP "SATANIC ROCK"
CONERS OF SANCTUARY - Album "HARLEQUIN"
LOVER UNDER COVER - Album "Set The Night On Fire"
SACRED GATE - Album "When Eternity Ends"